The exhibition Hydrosphere works in extension of the newly published translation of Astrida Neimanis’ Hydrofeminism: Or, On Becoming a Body of Water, which presents a watery understanding of our bodily connectedness. The exhibition explores what it means to be (in) a body of water, in both a corporeal and planetary sense. As bodies of water, we are always immersed in hydrospheric circulations, where our most intimate bodily fluids become planetary archives. Water connects us across bodies, species and landscapes, but also across scales. The exhibition presents site-specific and performative works that propose new hydrospheric choreographies. 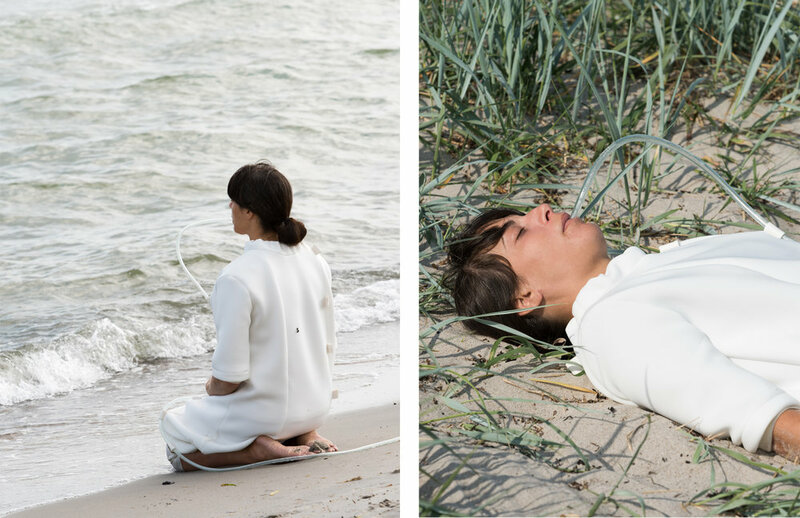 Breathing with the ocean stages a symbiopoetic encounter between two bodies of water. Bodies and ecosystems meet in this ecotone for a mutual breathing. How are we mutually implicated by our shared waterways? How are the boundaries of our bodies extended due to their permeable membranes? How can we re-choreograph the space between us? 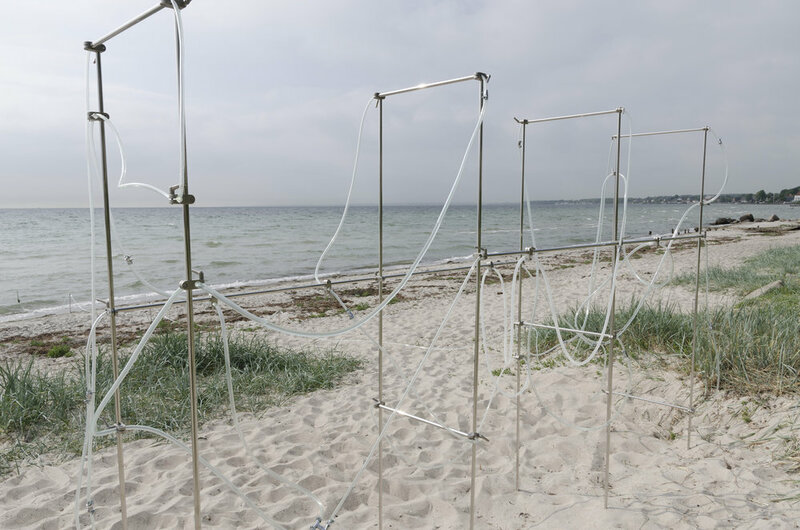 The installation is placed on the beach at Snekkersten in Helsingør. The vinyl and silicone tube system anchored to the stainless steel construction has two open ends, one reaches the water level in the sea, the other the oral cavity of the human body. A subtle movement of water inside the tube system occurs as the flow of air from the body meets the push of air caused by incoming waves. The installation is activated at three occasions during the exhibition period. A body dressed in white neoprene gets connected via a tube running to her mouth along one of the seams in her suit. Her movements are very slow. Outside of performance hours the installation is interactive. Everyone can connect and breathe with the ocean simultaneously as watching the mutual meeting inside the tube system.